Swadesh Kumar Sahoo was born in Balasore, a city of Odisha (earlier it was named as Orissa), on 5th February 1978. He has obtained his Master's Degree in Mathematics from Utkal University, Bhubaneswar (Capital of Odisha), in 2000. He received his Ph.D. degree from Indian Institute of Technology Madras in 2008. His Ph.D. thesis entitled “Inequalities and Geometry of Hyperbolic-type Metrics, Radius Problems, and Norm Estimates” was written under the supervision of Professor S. Ponnusamy, IIT Madras. The National Board for Higher Mathematics, Department of Atomic Energy, awarded him the NBHM Post-doctoral Fellowship in 2008. With this fellowship, he did his post-doctoral research in IIT Madras until he joined IIT Indore in September 2010 as an Assistant Professor. He had been a visiting researcher in University of Turku, Finland supported by Centre for International Mobility (CIMO) in 2009. 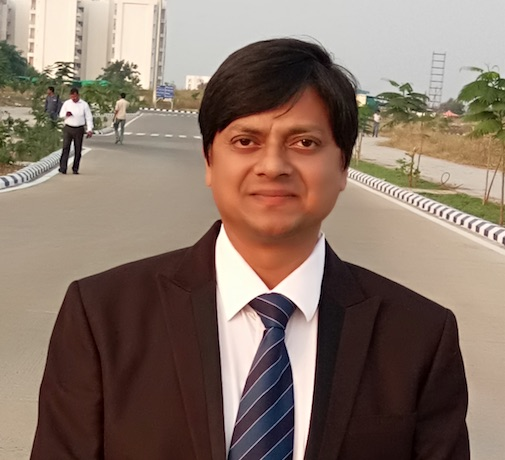 After joining IIT Indore, he has participated and delivered a series of invited talks in several scientific events held in India, Japan, China, United States, and Ukraine. His main research area is Geometric Function Theory and the current research interests include Univalent Function Theory, Special Functions, Hyperbolic-type Metrics, and Quasiconformal Mappings. He has been collaborating with researchers from India, Japan, China, United States, and Finlad. He supervised three Ph.D. scholars, one M.Sc. student, and at present, he is supervising three more Ph.D. scholars. Currently, he is working as an Associate Professor in the Discipline of Mathematics, School of Basic Sciences of IIT Indore. He was heading the Discipline of Mathematics from June 20, 2012 until September 24, 2015, and the School of Basic Sciences during April 3, 2015 - May 22, 2018. His current administrative responsibility also includes Dean, Administration at IIT Indore.